The focus of development in today’s world is to increase production and income. But will more money lead to ‘No Hunger’ and help create a healthy and nourished society? Mungjoria, with a population of 700 is a small and a well-off agrarian village in Sonaraythadi block of Deoghar district in Jharkhand. 75% of the village land is under agriculture which includes uplands, middle lands and low lands. This agricultural land is well irrigated with water from wells and ponds being available throughout the year. The farmers grow paddy in the low lands, wheat in the middle land and maize in the uplands. Besides 15 to 20 varieties of vegetables which are grown throughout the year, most farmers also grow chickpeas, mustard and green grams. The village is also well connected to the local market or ‘Hatia’. Despite all the positives, 20% of the children in Mongjoria are undernourished. Sunil Verma, a native of this village is a well-off farmer with a similar story. His family owns four acres of land where they cultivate cereals and pulses. Besides these, Sunil also grows around 17 types of vegetables round-the-year which he sells at the local market daily. 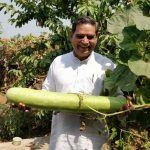 Like many others in the village, Sunil earns well for himself and his family and sells an agriculture produce of nearly INR 30,0000 million annually. 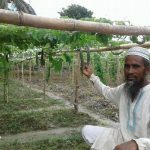 Out of INR 25000 which he makes monthly, INR 8500 is reinvested in buying seeds, pesticides and fertilizers. He also owns some cattle and sells the animal products as well. He currently lives in a 4-room mud house but is in the process of building a new concrete house. Despite earning well for his family, Sunil was unaware that his youngest son – Karan, out of his three children, was severely malnourished. At 38 months, he weighed only 10.9 kgs. And as a father, Sunil thought that perhaps the child wasn’t eating enough. Karan who was diagnosed as severly malnourished with his father in front of their agricultural land. However, a deeper look into the issue painted a different story. It was found that the child’s diet was not balanced, and the necessary micro nutrients were missing, same was the case for the family. They did not achieve the minimum dietary diversity standards of at least 5 out of 10 food groups mentioned under the ‘Food and Nutrition Technical Assistance (FANTA). Although the family was producing around 9 food groups; cereals, pulses, oil seeds, yellow and orange vegetables, dark green leafy vegetables, other vegetables, milk/diary, poultry and eggs on their own farm, their diet was restricted to only cereals, potatoes, vegetables and some diary. They sell most of what they grow to make atleast three-fold profit over their investment. The money earned is mostly spent on buying pesticides, fertilizers, seeds and for other exigencies such as weddings, which are quite cost intensive. Additionally, the women of the house had a hard time balancing their time between home, children and farming. They do everything from cooking, cleaning, taking care of the children, harvesting the vegetables, sowing paddy during the paddy season, trashing and de-husking the paddy, packaging of vegetables for the market to fetching water. Therefore, the meal they cook are quick vegetable curry and chapatis/bread. Sunil’s wife, Anita, who is 25 years is totally weighed down with work and responsibility. When Karan was conceived Anita had a lot of dietary restrictions such as no papaya, banana, jackfruit, beans, pumpkin, cabbage, meat and so on. 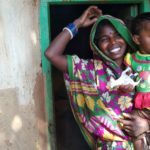 Anita’s mother in law said, “Eat less and work more, you will have a hassle free, normal delivery.” Today, Anita finds it hard to attend to her children’s dietary needs on an individual basis. Besides, she says they prefer eating what grows in the kitchen garden and the food that has less chemicals. For a farmer like Sunil, organic farming is a remote possibility since they are content with the high cash returns. Although they realise the harmful effect of chemicals, yet they use it for farming because of higher yield and better price in the market. He prefers fertilisers over natural manure. The farm waste is used as fuel and the kitchen waste is dumped around the house. The waste water from the house flows on to the streets and gets accumulated in potholes along the road side. It is also found that the soil is totally drained of natural nutrients and mono cropping of vegetables and market driven production has done the damage. Sunil’s​ agricultural farm where he regularly uses chemical fertilizers. Sunil does not realize that earning more money will not make Karan healthy. Until Sunil and his family change their consumption pattern and bring in diversity in their diets, Karan will continue to be undernourished with a stunted body and a brain. Ironically, neither Sunil nor Anita seemed concerned about the low weight of the child. Sunil is one of many such farmers in Mungjoria village whose children are malnourished. He completely understands that the high yield of crops is a result of high yielding seeds and strong chemicals and fertilisers. 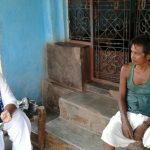 The pesticide companies visit the village regularly to apprise them about new chemicals and Sunil himself is aware of 25 to 30 types of chemicals that are used for agriculture. It is said that fertilizers, high yielding seeds, bio fortification, pesticides, herbicides and the others will increase production to feed the growing population in India, but the Karans’ are still starved. It is perhaps far too late to decide on the use of chemicals in agriculture in the developing world as we are sold out to the MNCs from developed countries who sell poison and propagate organic and safe food. 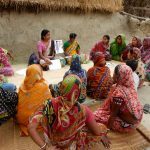 For us the question persist that will the ‘Karan’s’ of today break out of the poverty cycle and reduce the burden of disease, both communicable and non-communicable? Will they grow up to be a strong workforce to take India ahead? To answer these questions, Welthungerhilfe has adopted a multi-sectoral nutrition-sensitive approach which enable small-holder farmers to draw their food and livelihoods from the natural environment. The Linking Agriculture and Natural Resource Management towards Nutrition Security (LANN+) approach is centered around family nutrition particularly with regard to accessing adequate and healthy food, diet diversity, a sanitary environment and care practices for vulnerable family members. Sunil​ with his wife Anita and son Karan.